For robots and machines to behave like soft biological organisms and be safe for contact with humans, they need to be made out of soft, lightweight, and deformable material. In particular, they require multifunctional composites that can serve as “artificial” skin, nervous tissue, and muscle. To address this, we are exploring new combinations of materials that exhibit unique combinations of electro-thermo-elastostatic properties and couplings. We have recently discovered that elastomers embedded with a polydisperse suspension of liquid metal (LM) inclusions exhibit mesoscale properties never before seen in soft polymers. These LM-embedded elastomer (LMEE) composites can be tailored to have high electrical permittivity and thermal conductivity. LMEE composites can also be engineered to be electrically conductive. This is accomplished by applying intense surface pressure, which causes the LM droplets to rupture and form conductive pathways. 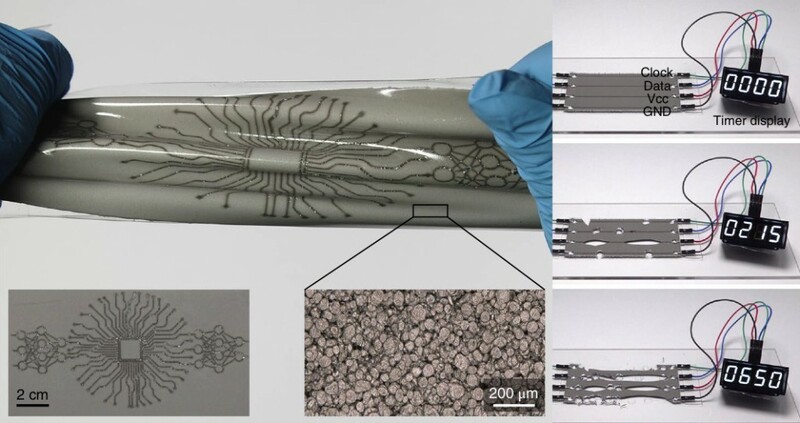 Recently we found special compositions for which these pathways can exhibit a self-healing property — when cut, torn, or punctured, the droplets automatically form new conductive pathways in order to maintain electrical connectivity within a written circuit. In order for soft materials to perform mechanical work, they must be able to tune their elastic rigidity. As with natural muscle and catch connective tissue, this rigidity change must span 1-2 orders of magnitude. Recently, we have developed a novel composite material capable of changing its tensile elastic modulus between ~1 to 100 MPa, similar in range to striated muscle. This is accomplished with a percolating network of carbon black in a thermoplastic propylene-ethylene co-polymer. The composite is rigid at room temperature and softens when heated through electrical current.